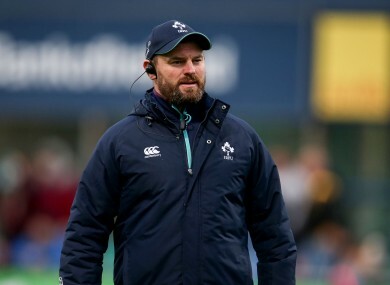 CONNACHT ACADEMY MANAGER and Ireland U20 head coach Nigel Carolan will take a place on the western province’s senior coaching ticket this summer. New Zealander Kieran Keane will replace Pat Lam as head coach at the Sportsground next season and the province have today confirmed that current forwards coach Jimmy Duffy and Carolan will be among his backroom team. “To coach at the top level in Connacht is a huge honour,” says Carolan, who has been in charge of the Connacht academy since 2004 and the national U20 side since 2015. Connacht CEO Willie Ruane says that the full make-up of the coaching ticket will be finalised in the coming weeks, but highlighted the benefits of appointing homegrown coaches to work alongside Keane. “The fact that both are local coaches who have come through the Connacht system is a massive positive for the club and further illustrates our vision of Grassroots to Green Shirts. Email “Ireland U20 coach Carolan to join new Connacht coaching ticket”. Feedback on “Ireland U20 coach Carolan to join new Connacht coaching ticket”.